On Friday morning I got up and walked myself to my Weight Watchers meeting to do my August weigh in . I was thrilled to find that I had lost .6 pound... I was sure I had gained. All this running and walking is allowing me to eat more, it appears. I have been HUNGRY lately, and not making the best of choices. 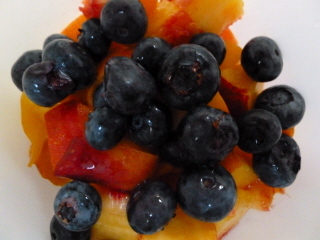 A bowlful of blueberries and nectarines with On Track high protein cereal, and a bit of unsweetened Vanilla Almond Breeze... it probably seems odd to sit and eat during a WW meeing, but it is a morning session and lots of us do it. The meeting topic was Food as Fuel which is very timely for me right now. This is a subject I have been thinking and reading lots about lately. I am reading a book called Performance Nutrition for Runners. The Captain and I walked downtown and back after lunch and my legs felt good... I had had a bit of cramping in my left calf during the night after my trail run on Thursday, but all the walking I did Friday seemed to help. Saturday morning we had our usual pancake and egg breakfast before heading off to the Farmer's Market at the fair grounds. These baskets always intrigue me. I imagine myself walking to town to do my shopping with a basket instead of cloth bags.... someday, maybe. But I did score some lovely green and yellow zukes, and some huge blueberries. Then we headed into the City and decided to have a shopping day... picked up some more veggies at an out of the way market stall... had some lunch... found an awesome buy on some Land's End shorts and jeans for The Captain, and then started looking for some new running shoes for me. Buy new running shoes always strikes a little fear into me... I don't buy them all that often and although I know about cushioning, motion control and stability... not every shoe shop has knowledgable staff or has their shoes 'marked' by type. We went into a Running Room first... where they do sort by type, and stock the latest models, but I find the whole atmosphere quite intimidating... okay off to a local running outfitter called Peninsula Runners. They had lots of neon shoes, and an uninterested fellow, all alone in the store, texting... hmmm... okay then. Next, we went into a Champs in a mall. I picked up a shoe off the wall that I kind of liked the look of, took it to a clerk and asked if it was a running shoe. He said 'yes'... so I pressed him... ' a RUNNING running shoe?' and he said 'no'. Very helpful I thought, and off we went. Finally... we found a SportMart, a chain where I have found aerobics shoes and running shoes in the past, but have never shopped at this particular location before. I looked at the wall of shoes, and a young man came over to talk to me. He started asking me some pertinent questions so I told him how far I run, how often, and we talked about my foot, my arch, my neutral footstrike, and I was perking up because he was talking like he knew what he was saying and was actually interested in it... we talked about shoes I had liked in the past and some I didn't and he told me why I likely didn't like them... and he suggested a few for me to try on... I came away with 2 pairs of Saucony shoes... and I am so happy!﻿ And they look good too... black and silver. Now I have to say that I have developed a little twinge near my right knee cap... and it followed me throughout the day on Saturday... I am going to wait a couple more days to try out the new shoes, just in case it is a real injury. Don't want to aggravate it by running on it... but I am so excited about the new shoes I really don't want to wait.... but I will. Glad you found shoes that work for you - that seems to always be a chore, especially if you feel like the people in the stores who are supposed to help you, don't! I hope your knee is not injured and maybe just needs to rest. That Farmer's Market looks AMAZING! I always love your photos! I love that the guy told you it was a running shoe but when you pressed him it wasn't a running shoe? Odd. But yay for new shoes. Love all the pictures, red beets are one of my favorite veggies. I want one of those baskets, although i have no idea what I would do with it!